Of course it would be very easy to have a Clash track every week as ROTW, such is the depth of their musical legacy, but we don’t like phoney Beatle mania ’round here. This rather unique 1980 release is a bit of an enigma, is it an EP? Is it a triple A-side!? Found on the “other-side” of 1980’s “Train in Vain”, this 7″ single plays at 33rpm and gives you just over 9 minutes of The Clash at the height of their powers, in rub-a-dub stylee. It’s a quiet riot. 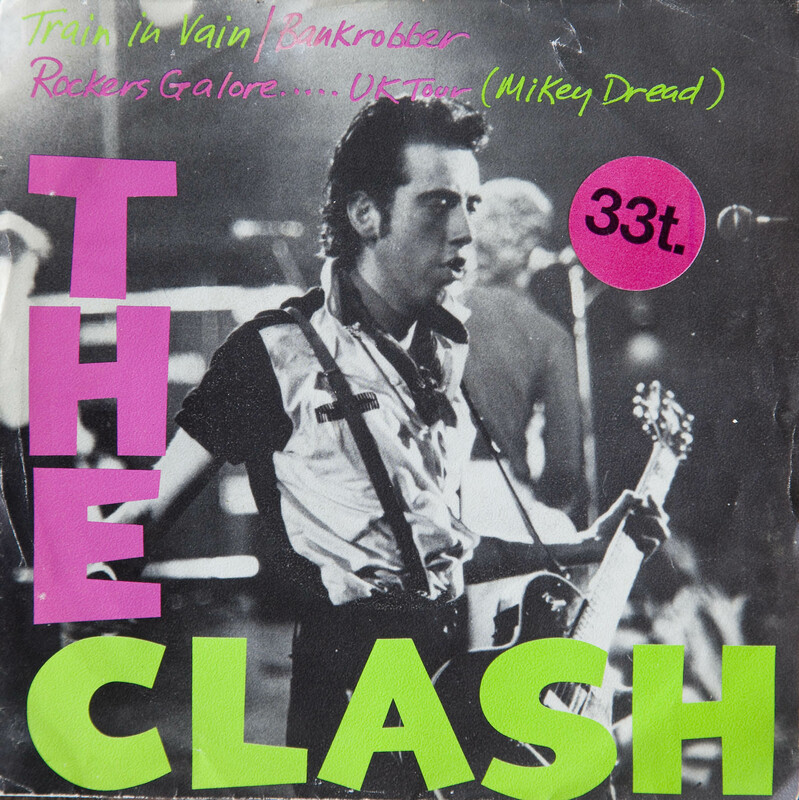 The cover art is a variation on the theme of the “London Calling” album sleeve, (itself a pastiche of the classic “Elvis Presley” cover). No smashing guitars here, just Mick Jones looking cool in monotone with “THE CLASH” in flouro pink and green. The last gang in town, with Mikey Dread ……. on a UK Tour, what more could you want? This entry was posted in Music and tagged 7" single, Bankrobber, MIck Jones, Mikey Dread, Record, Rockers Galore, The Clash, Train in Vain, vinyl. Bookmark the permalink.